The Integrated Authority File (German: Gemeinsame Normdatei, also known as: Universal Authority File) or GND is an international authority file for the organisation of personal names, subject headings and corporate bodies from catalogues. It is used mainly for documentation in libraries and increasingly also by archives and museums. 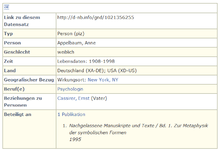 The GND is managed by the German National Library in cooperation with various regional library networks in German-speaking Europe and other partners. The GND falls under the Creative Commons Zero (CC0) license.